We may consider Enrique Casella one of the Argentine composers whose work most requires a fresh assessment. The breadth and intensity of his activities was phenomenal: concert violinist, pianist, viola player, symphonic and choral conductor, composer, opera conductor, teacher, stage designer, writer and educator. To cap it all, during his "spare time", he devoted himself to the art of painting and engraving pieces of furniture. He was the son of the Italian violinist and conductor, Italo Casella (1862 � 1936) who was himself very well-known in Italy, Brazil, Uruguay and Argentina. Enrique studied at the Argentine School of Music with Ferruccio Cattelani and Edmundo Pallemaerts. His family believes that the famous Dante Alighieri was one of his ancestors. So far, we have not been able to prove if there is any family link between Enrique and the famous Italian composer Alfredo Casella. Once his family settled down in Buenos Aires from 1896, in 1907, he traveled to Europe for postgraduate studies with the masters Consolini (violin), Marco Enrico Bossi (counterpoint) and Carpessani (piano) at the High School of Music in Bologna, and in 1909, at the Royal School of Music in Brussels, with César Thompson (violin), Paul Gilson (composition) and Maurice Staminat (piano). According to certain investigations, he had been awarded a First Prize in Violin in Brussels. He returned to Buenos Aires between 1911 and 1912. In 1913, again in Europe, he studied in Paris with Paul Antoine Vidal and Foucher, probably at the Paris Conservatoire. In 1914, he was forced to return to Buenos Aires due to the beginning of the war. This year was the first time he had traveled to Tucumán (capital of the Argentine province with the same name) to conduct courses at the Escuela Normal and Colegio Nacional. By 1916, according to our investigations, he had already written eighty works. Between 1918 and 1920, he settled down in Goya (Corrientes province) creating a School of Music. In 1919, he wrote his first Sonata in C Major for violin and piano in this city. In 1921, he settled down definitively in Tucumán where he was appointed professor in the Fine Arts Academy. Subsequently, he founded the Musical Institute of Tucumán (1922) with his friend Luis Gianneo. He also established the Symphonic Association of Tucumán (he was the president in 1930), the Tucumán Trio (1923) and the Tucumán Quartet (1940/42). He was the conductor of Santa Cecilia Choir and of the Provincial Band of Music (1937). He was a member of the Rotary Club, of the Argentine Association of Composers (ex-National Society of Music) and the President of Sarmiento Society (1945). Casella worked, seemingly inexhaustibly, as an orchestral conductor in symphonic concerts and operas in Mendoza, Salta, Córdoba, Buenos Aires and Tucumán. He played in Bolivia, Colombia, Peru and Chile between 1931 and 1932. His repertoire was wide encompassing European and Argentine music and jazz in a duet (violin and piano) with Gianneo in Lima (Peru) with the style of the famous jazzman of the violin, Joe Venuti. It will come as no surprise tat Gianneo and Casella also presented some of their own musical works at these concerts. During the era of the �silents�, he provided accompaniments, playing all kind of music, at the Majestic cinema. It was very common to see Casella conducting symphonic works in the first part of a concert and in the second part, playing some famous violin concerto, such as Beethoven�s (with Hubert Leonard�s cadenza) or the violin concerto in B minor by Saint-Saëns. He admired the most prominent violin players of his time, but he preferred the Austrian Fritz Kreisler, as he used to identify himself with this great musician for his modest personality, his technique and his sensual sound. Casella�s repertoire included many of the most difficult works for the instrument, such as the Bach sonatas and partitas, Vieuxtemps' concerti, the Ernst F sharp minor concerto, Paganini�s and Sarasate's works and the Ronde des Lutins by Bazzini. It is important to mention that in the Argentina of that period, it was unusual to listen to complete sonatas by Bach. Casella made it possible. We may add � as relevant information � that Enrique was one of the persons who made it possible for the young violinist Henryk Szeryng to travel to Tucumán with the purpose of promoting this great Polish musician in that province. Casella conducted for Szeryng in the Concerto in D Major op.77 by Johannes Brahms, at the Alberdi Theater on July 9, 1942. It was said that Szeryng had offered to establish an Argentine school for violinists in order to educate young people. He requested Argentine citizenship in return. However the government rejected the offer leaving Szeryng to go to Mexico where for many years he did excellent work, finally securing Mexican citizenship. It is not very well known that in Argentina Szeryng recorded Llanura for violin and piano by the Argentine composer Carlos Guastavino (recently dead). This recording of Szeryng and Guastavino has high historic value. Coming back to Casella�s life, we may say that quite apart from all the activities previously mentioned, he investigated the country�s folklore and the folklore of countries such as Bolivia, Colombia and Peru. He and Manuel Gómez Carrillo, Andrés Chazarreta, Ana Cabrera and others, were the first Argentine persons to compile the musical folklore of the Northern regions of Argentina. As a pedagogue, he contributed with a compendium of twenty-five singing solfeggi and some technical exercises for violin. He trained an excellent group of students spreading the Franco-Belgian technique. His master Thompson was the pedagogical successor of the extraordinary Belgium violinist Eugene Ysaye, himself the dedicatee of the sonata for violin by César Franck. Enrique had such a strong affection for his master that years later, after discovering the poor health and economic conditions he was passing through, he organized a concert in Tucumán to raise money on his behalf. This was not the only occasion that Enrique organized concerts for such altruistic purposes without personal gain. It is interesting to mention that in this same period, Casella created music for films with two important directors � Luis Moglia Barth and Mario Soffici � works that received positive critic. We suppose that the fact that he worked in the cinematography field gave him certain ideas and knowledge that, with his experience in lyric theatre, enabled him to elaborate reforms that he presented in his "Triptych". We have the opportunity of seeing the film La barra mendocina and examining the music composed for that purpose. He alternated typical incidental parts of that kind of music with popular and easy-hearing pieces of music, but with an invaluable artistic and musical sense. The beginning of the film reminds the opera style. The film Amalia, according to José Mármol�s narration, directed by Moglia Barth, with stage design by the famous Argentine painter, Raúl Soldi, was considered a serious and successful production. It included technical innovations in relation to the sound � that even today we can appreciate � and as anecdotal information, one of the characters was represented by Alfredo Gobbi, father of the famous tango musician of the same name. Casella created the music of this film with other collaborators. In this occasion, it was more difficult for us to recognize Casella�s music from third musicians� in this film. Both works have scenes of silent film types � yet in life in our first sound-films during those years � , such as long dramatic scenes without text but with background music. Concerning the "triptych", one of the renewal that we can notice in these works is the elimination of the verse in the text in order to liberate the lyric composer from the tyranny of the poem measurement and the division of the orchestra into three groups that should be located inside the stage, out of people sight and not in the space underneath the stage, as traditional. For example, in Chasca, the instrumental groups have not strings and they are divided in the following way: A)1 flute, 1 oboe, 4 saxophones, 2 clarinets, 1 bassoon, 1 harp y 2 timpani B) 2 trumpets in F, 4 horns, 2 trombones, 4 saxophones and 1 Gran Cassa C) 2 flutes, 1 oboe, 2 clarinets, 2 bassoons, 4 horns, 2 trumpets in E flat, 2 trombones, 1 bass tuba, timpani and Gran Cassa. The stage design of these three small operas have been detailed with drawings by the author and the change of colors, the lightening and the specific spotlights location. Summarizing, these works would allow an interesting stage design play with the current techniques without betraying the original ideas of the author. According to the critics of that time, the musical language of this work is mainly diatonic including rude dissonance and some atonal parts. Casella could nearly contemplate his invaluable contribution of these works, since the second and the third part of the triptych were never presented on stage. Chasca was successfully performed for the first time in Tucumán in 1939, but the supposed authentic renewal of the Argentine lyric theatre never occurred because the master would never be helped to represent the two remaining parts of the triptych.2 As Gloria Casella remembers � Enrique�s youngest daughter � the costumes for Chasca was designed in the family house with support of acquaintances and friends who embroidered and recreated the traditional costumes necessary for the northern opera setting. Other prize works were the Quintet for strings, horn and piano (Municipal Prize of Buenos Aires, 1927), the symphonic poem Brujerías based a poem by Juan Carlos Dávalos (Municipal Prize of Tucumán, 1932), and the National Prize for his lyric drama La Vidala (First Prize Culture Commission, 1942). This opera, supposed to be the last complete work for stage by Enrique, orchestrated for woods x 3, 2 harps, male and female choir and various characters, has the typical characteristics of Casella�s music, but covered with some dissonant language in some parts without losing his own style nor showing influences that he could not amalgamate, producing a fluent musical hearing, typical of the author. In another parts, we can find aspects similar to the works by other well-known Argentine opera composer: Constantino Gaito. La Vidala is divided into 5 acts or "stages", the plot by Alberto Córdoba Alais, whom Casella appreciated so much. The clear score of this work is at the File Record Section of Colón Theater of Buenos Aires. It is autographical. As many operas of the master, it remains unknown. Another opera that was not presented but that might have contributed to the musical history of Latin America is El Maleficio de la Luna, a fantastic and surrealist work, with cruel and heartbreaking parts where Casella used, perhaps for the first time in Argentina, an atonal language with other more lyric language but without applying autochthonic music or simply melody. Applying the excellent plot of the Italian Bontempelli, whose fantastic realism inspired subsequently to many generations of Latin-American writers, is an important exception in Argentine opera history, where national plots were preferred during those years. Casella is considered to have a very vigorous personality, passionate in his ideas. 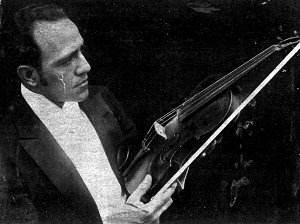 The musician and stage designer, Guido Torres, has expressed his enthusiasm about his master: as an artist and as a creator: a tireless worker; as a human being: honest and generous; as a violinist: one of the most distinguished in Argentina; a violin player at the same level of the most remarkable international violin players (this comment is relevant taking into account that Guido Torres has been a professional violinist and had personal relationships with many virtuosi, such as Ruggiero Ricci). He remembers the proverbial sound that he reproduced with his violin, a Domenico Montagnana from XVIII century (that we were pleased to evidence). Guido Torres also told us that he was very surprised at the Concert for violin and orchestra, and the solo-violin work Brujerías (we ignore the relationship between this work and the symphonic poem with the same name), both works with northern folkloric character, showing a fluent violin technique. According to Gloria Casella, Enrique and Gianneo�s families lived together in the same house in very good terms, and that their respective daughters keep nowadays. Unbelievably, his work and music were ignored by European musicians that emigrated to Tucumán due to political problems of the old continent, who had very important posts in official institutions of musical culture in Tucumán. These musicians mainly spread European music and performed a very intensive teaching activity, but in contrast to Enrique, under no circumstances did they create a movement or any Argentine school for composition - fundamental base for any important development- making the students ignore the composer from Tucumán. In this way, the following generations were educated ignoring Casella�s life and work. Enrique�s artistic work has been obstructed due to this unfair event, becoming worse when his friend Luis Gianneo decided to go to Buenos Aires in 1942. Enrique was likely to be convinced by Luis to go to Buenos Aires with him to become known in the musical atmosphere in the Argentine capital, but Casella wanted to avoid the influences of Buenos Aires and he wished continue spending the spiritual peace the province provided him in order to compose; therefore the friends had separated their lives. The fact that his work did not enter in Buenos Aires was perhaps the reason for its ignorance, even of his friends from Tucumán. Casella died in 1948, when he was 57 years old, being an Argentine citizen. His health had weakened from 1946. He was operated on one of his legs in Tucumán, losing a vein. Subsequently, he suffered from many swoons up to cerebral dysfunction that, after a prostration year, led to death. The following year, on April 8, 1949, his friend Juan José Castro � one of the most important Argentine musicians - conducted Casella's symphonic work Acuarelas at the Colón Theater of Buenos Aires, perhaps as paying homage to the master. This was the unique Casella�s work that was performed in our most important coliseum, up to our knowledge. Taking into account that there is no registration of his works nor catalog, and considering that his manuscripts are widely spread, it is difficult for us to analyze his creative work. In our research, we could find a lot of material in Buenos Aires and Tucumán, but a great amount of works is missing and we are only submitting - for the first time - a list known by references or that have been preserved, as its pertinent analyses exceeds the presentation of this article. Song and orchestra: Brumas (1937) (text by the author); 4 songs (voice and chamber orchestra). Choir a capella: Cantar de arriero (1930, presented for the first time in 1936) (text: R. Jijena Sánchez); Canción de las voces serenas (Three female voices � 1934; text: J. T. Bodet); Three Vidalas (plaintive folk song in Argentine.) (ca. 1935? ); Baguala (with "caja" - type of Indian drum) (1930, text: R. J. Sánchez). Choir and orchestra: Segunda Suite Incaica "Pachacutec Inca" (from Las Vírgenes del Sol?) (1926). Religious music: Mass for chamber orchestra, organ and male choir (1938); A Santa Teresita del Niño Jesús (solo voice, violins, organ and choir, 1938); Himno a Santa Inés (female choir and harp, 1939); Himno de los Niños Católicos (song and piano, 1941). Piano and orchestra: Concerto in F Major (1945). Ballet: Los Poemas del Agua (1933). Parts: La Lluvia; El Manantial; El Lago; El Arroyo; El Torrente; El Mar. Piano: Sonata; Preludes; Study in F (1945); Three Norteñas, and diverse pieces of music. Song and piano: available near 50 songs, in Italian and Spanish. Mimo-drama play: Caperucita (song, recitative and piano; Goya, 1920). Chamber music: Suite in old style for flute, oboe, clarinet and bassoon; Quintet for piano, violin, viola, horn and violoncello (1925); First String Quartet (1928); Second String Quartet "Romantic" (1944); First Sonata for violin and piano (1919); Second Sonata for violin and piano; Suite Quechua: Orgía del Inti Rayn - Ha muerto un inca � Danza del Fuego (lyrical legend for quartet of lutes, presented for the first time by "Cuarteto Aguilar"); Six Songs for voice and string quartet; Antaño y Ogaño - I: Aria - II: Angustias (Piano, Violin and Violoncello) 1941; diverse short pieces of music and Argentine dances for violin and piano. Operas: Corimayo (libretto: Luis Pascarella) premiered at the Teatro Alberdi of Tucumán and at the Teatro Avenida, in Buenos Aires (1926); Las Vírgenes del Sol (libretto: Ataliva Herrera) (1927); El Maleficio de la Luna (libretto: Bontempelli) (1932-34); La Tapera (libretto: Enrique Casella) (1929) premiered at Teatro Cervantes, in Buenos Aires (1934); El Embrujo de la Copla (libretto: Rubén F. De Olivera) (1935); El País del Ensueño (libretto: Ricardo Chirre Danós); Triptych: a) Chasca; b) El Irupé; c) El Crespín (libretto: E. Casella) (1937/39); La Vidala, 5 acts (libretto: Alberto Córdoba Alais) (1942). ; Karchis (unfinished); Juan María Veniard has found references to: Adamá and Huancú. Transcriptions: Casella is supposed to have transcribed the music of other composers for choir, bands, etc. We have discovered three of these: Six Inca Preludes (P. Chávez Aguilar) for string quartet; Canto popular Basko by Padre Donasti, for violin and piano in 1927; Eight Peruvian Songs for string quartet (1940). Argentina, Bolivian and Peruvian folkloric music compilation. The author of this article is a conductor, composer and violinist, and his main activity in the field of music is to investigate and play Argentine-related music. © Copyright 2002 - Lucio J. Bruno-Videla - Grupo Drangosch para la Difusión del Patrimonio Musical Argentino.